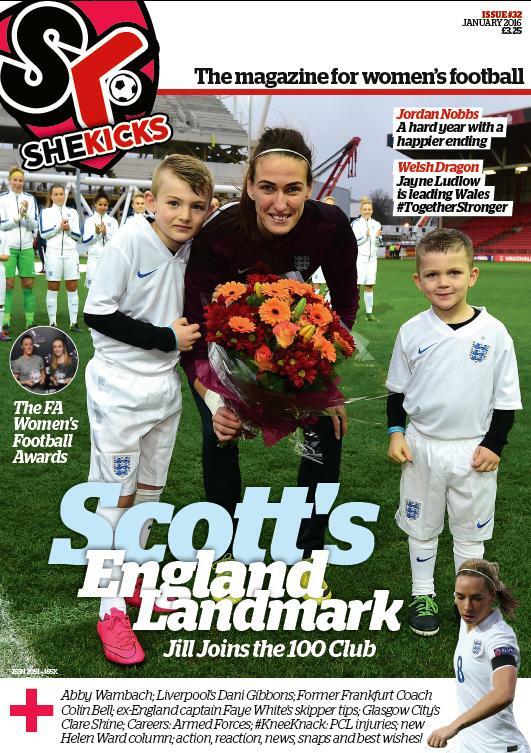 #32 of SHE KICKS mag is 72 pages of women’s football goodness. It’s GLAMOUR-sized (fits in yer handbag/bootbag); full colour and jam-packed with news, interviews, photos and posters (inc. Lucy Bronze & Jane Ross), some advice and some silliness too. Interviews include: #Lionesses’ latest centurion Jill Scott, Arsenal’s Jordan Nobbs, Wales boss Jayne Ludlow (plus Reading & Wales striker Helen Ward’s new column), ‘retiring’ U.S. superstar Abby Wambach, former Frankfurt coach Colin Bell, Faye White, Beth Mead, Lianne Sanderson, Clare Shine, Wolves, Forest, Carlisle United and lots more. We talk to players of all levels and ask them about 2015; the FA People’s Cup is back for 2016; we learn about PCL injuries; playing and being in the military in our new careers feature, our TOURS & TOURNAMENTS GUIDE and a shed load more. WANT TO BUY THE DIGITAL VERSION INSTEAD? HAVE A LOOK IN THE SHOP – IT WILL BE AVAILABLE IN A FEW DAYS TIME. Contact shop@shekicks.net if you’re having any difficulty.